Call it comfort food, street food, sharing food. This is food that warms your bones and satisfies your stomach. It's food that takes everyday ingredients and knocks them together with ease, ingenuity and style. One of the 'Incredible Spice Men as seen on BBC 2, Tony Singh is a man who knows no boundaries. 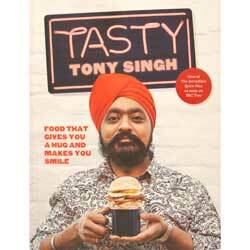 A Scottish Sikh chef with a passion for British produce, a taste for spices and a mischievous twinkle in his eye, Tony has taken his cue from the inventiveness of street food. The result is over 100 recipes that will take you on a cultural rollercoaster of a ride. From muttia, popcorn, Desperate Dan beans through chipotle meatballs, roast pork belly with chermoula, venison and haggis burgers, sardines with Lebanese lentils to voodoo doughnuts and hazelnut dukkah. "Dear Spices of India, Just to say thanks again for a superb service. 10/10"